Real, professional framers are hard to find. Framers like us, with a genuine understanding of appropriate presentation, conservation practice, and the need for real works of art to stand out for themselves in a well considered and made setting, as well as the true expertise required for handling and manufacture. We offer hundreds of options of moulding and mountboards, as well as a range of specialist glazing, ready to frame anything that you bring to us. If you have a picture you want us to frame, bring it to us in our gallery showroom to see our range of options, and for a free, no obligation quote. At Gallagher & Turner we can frame anything from 18th century painting to contemporary artworks, through family photographs, posters and textiles, in a wide selection of styles (some of which are exclusive in-house designs and finishes) with meticulous care and attention to detail. 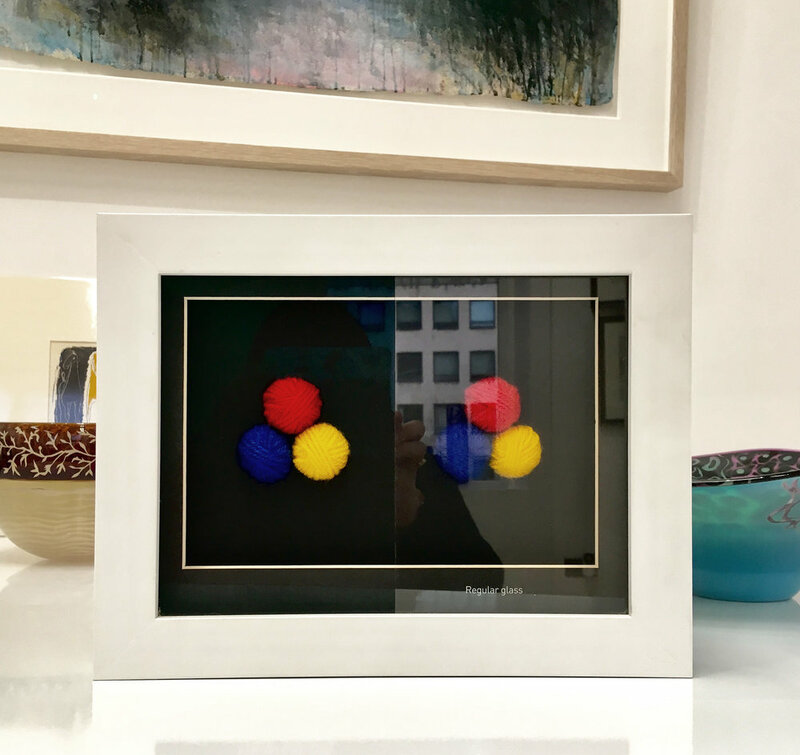 We make frames for all kinds of clients, including art galleries, museums and universities as well as working with interior designers, collectors, artists and photographers. Many of our clients are happy to have had Paul make frames for them for over 20 years but we also welcome those people who've never been to a bespoke framer before: we make plenty of time to talk things through without obligation. There are many choices and variations to suit personal tastes and budgets, but we are here to offer advice and not to make rules or decide for you (unless, of course, you ask us to!). We have well over 250 types of moulding, hand-finished frames, gilding and the North East's widest range of specialist glazing. With our workshop and showroom based in the centre of Newcastle we are very easy to locate and you can drive right to our door. It is a good idea to let us know when you wish to visit (that way we can allow the time you need for your consultation) but not essential. Prices are variable depending on choice of moulding, type of glass, mounting etc, but everyone likes a vague notion of what to expect to get a picture framed properly. Budget framing can start from just £30; we can frame a large poster for around £60, a medium sized watercolour can look fabulous for about £160. You can easily spend less, and you could also spend more, but be comforted that the price includes tax, picture hooks, etc. Our gallery is your first port of call for expert advice on picture framing, conservation and gilding. We have hundreds of moulding and mountboard samples to create the perfect frame for any artwork or object, as well as a changing programme of exhibitions of Modern and contemporary art, often showcasing some of our finest framing. Our dedicated framing workshop has recently moved to Birtley. If you have very large work or very specialist requirements, we can arrange for appointments here by prior arrangement. Before visiting our workshop, please call us on 0191 261 4465 or 0191 410 9586 to arrange an appointment. To make most orders, and to see our widest selection of samples, visit our gallery showroom at 30 St. Mary’s Place if you would like to discuss framing options. An example of the difference anti-reflective glass can make on these identical prints by Wilhelmina Barns-Graham CBE, with crisp detail and full, rich colour visible with the specialist glazing on the right. A sample highlighting the difference between regular glass and one of our specialist anti-reflective options. Gallagher & Turner are pleased to offer a range of materials that you may wish to consider as an alternative to high quality plain glass. There are three factors which may determine your choice of glazing. The primary consideration is always about protection from light, i.e. conservation, and glass which can cut out the harmful wavelength in ultraviolet (U.V.) light will help to conserve artworks, retaining colour values and preventing accelerated deterioration of the piece. Secondary, but very important in the appreciation of beauty, is controlling the reflective surface. The third factor is preventing breakage where it is a possibility. Standard UV coated clear glass. This has a film covering the surface on the inside and therefore is as easy to clean as plain glass. The anti-reflective and U.V. blocking layers work together to block U.V. rays up to 97- 99% whilst countering reflection, and remaining fabulously colour true, where standard plain and coated glass will have a slight green colour cast. The surface is durable, but should always be cleaned with a non abrasive cleaner and a soft, clean cloth. 'Artshield' scratch resistant clear acrylic, and other good quality acrylics offer excellent U.V. light protection also. Reflection: the secondary, but also important factor in which choice of glass to use, is aesthetic. Being able to reduce the reflection created on the surface of the glass allows colours to glow, subtleties and textures to stand out, and can vastly improve the long term enjoyment offered by framed pictures and artefacts. It is well worth the extra investment. Reflection control coated clear glass will reduce reflection at 90 degrees to less than 1%, and will improve U.V. light filtering to 48% (plain glass is around 44%). A coating of oxides deposited onto the glass reduces reflections by counteracting and thereby 'flattening' the light rays as they bounce back off the surface. It also boasts true colour transmission, and gives a stunning effect of clarity. Museum quality reflection control water white clear coated glass is also a near invisible glass as above, which will protect the work as well as eliminate reflections. Both of the above types of glass are superb glazing for mixed media works with texture, unvarnished oils, charcoals, fabrics etc. as the quality of the surface remains vibrant and clear. Protection from breakage: glazing a large piece or placing a work in a public or busy area may require toughened glazing or acrylic. As one would not have internal glazed doors without toughened glass, a similar safety hazard applies to especially large glazed artworks. Artshield acrylic is a high quality clear material developed specifically for fine art applications. It is extremely resistant to surface damage, and has a good U.V. filter. The other advantage to acrylic is its lightness, especially significant for larger frames. Standard high quality clear acrylic in varying thicknesses looks excellent also. Laminated glass for larger options is available. It can come with an anti-reflective, U.V. coating, but can be thicker than standard glass and therefore heavier. Gallagher & Turner will be pleased to discuss options with you and provide a no-obligation price quote. Mounts and backing can be important elements in the framing process. Visually, mountboards can look wonderful when carefully underplayed beside the work on display, whilst also giving emphasis from fabulous to subtle when required. Mounts can also be vital to protect and preserve artwork at the same time as showing it off. Mounts come in a wide range of colours and thicknesses. The super-thick 4.1 mm gives a superbly architectural and modern feel with a deep, sharp wide bevel. Alternatively, mounts can be wash-lined to order, hand painted in watercolour with specific colours mixed for individual artworks. Fabric mounts add texture, and often depth for box framing. Conservation framing requires that a mount is acid-free, backs the artwork as well as faces it, and that any (acid-free) tapes used in the process are applied correctly. The chances are high that many items framed over ten years ago, or that are bought ready framed will have acidic mounting materials, which will burn into any artwork leaving visible damage. Any standard quality board will do this within approximately two years. Mountboard with mollecular traps, to prevent the deterioration caused by airborne pollutants is also an option for protecting artwork more comprehensively. We are happy to give a free assesment if you need advice about the mounting of your picture. Level 1 is suitable for prints and posters with a visual appeal. The board will not deteriorate as rapidly as standard board, but is not acceptable for a lasting, conserving standard. Levels 2 and 3 are suitable for conservation framing, and will preserve artwork indefinitely (for more information: www.artcare.info) Level 4, rag board is the ideal conservation standard. Combining border sizes, colour combinations and textures create variable, unique expressions of individual taste, and many mountboards can be combined to excellent effect. Experimenting with colour options shows how an image can be changed; we can 'spruce up' an old picture with a fresh clean mount or colour option to suit new decor, or we can go for a timeless, classic mount. All of our mounts are individually cut by hand by our expert team, ensuring a perfect finish for your picture, no matter what it is. At Gallagher & Turner we also restore damaged frames; including replacing or mending lost or broken areas and either completely re-gilding or gently toning in to the existing finish. Gilding can be real silver or gold leaf, which varies in tone, or a similar effect can be achieved with metal leaf, which can range in finish from bright metal to a dull distressed tone. Gilding with 'bronze' powders can be an option, often a softer gold finish with a more 'broken' surface and a dusting of rottenstone powder; but it can also be made beautifully rich with a good burnish. When a frame is past restoration, or if it proves too costly, we can often replace frames with something similar in period or style. We supply new hand made and finished 'swept' style frames to order with the same variation in finishes. We are happy to discuss the various options available, and give advice about what is possible, either for a frame repair or a gilt frame, please contact us on 01912614465 to make an appointment to discuss your project. We have strong links with a pool of conservators capable of cleaning and repairing works of art on paper and works on canvas, as well as a textile conservator. Conservation treatment will prolong the life of artworks endangered by damage from acidity and fungus attacks. The damp conditions of domestic interiors prior to central heating, combined with highly aggressive framing materials have created a destructive environment for many works of art, and attention to this will be rewarded by the prevention of much deterioration, and the consequent protection of your investment. Fragile watercolours can lose much colour and be spoilt by unwanted marks or 'foxing'. Oils can lose tension, the surface may crack, for example, and be discoloured from pollutants in the atmosphere. It is important to ensure that artwork that has been framed for some time is enclosed in the appropriate environment and is not suffering ongoing and devaluing discolouration or damage. We are happy to give advice about a picture; if you feel it may be in danger, check we are available, wrap it carefully to avoid damage (careful the back fixings dont damage anything it leans on either), and bring it to us for our opinion. After cleaning and de-acidifying, works on paper can be placed in a new, museum board mount, front and back, which is acid free along with the tapes and hinges for the work. This makes a new and conserving environment for the future. Watercolours and delicate prints would also benefit from UV light filtering glazing, such as 'museum' coated glass or acrylic. Oils, once cleaned and possibly re-stretched or re-lined, can benefit from new conservation varnishes, that will bring back the true colours and surface of the piece. More serious damage, such as tears, punctures etc can also often be repaired or consolidated by an experienced conservator. Illustrated: An oil painting affected by nicotine is photographed mid-clean. There may be some things you need to know about our customer policy. 2. Purchase Order: The purchase order is representative of the framework of a verbal agreement between the Customer and Gallagher & Turner. It is the Customer's responsibility to collect their purchase order when arranging supply of goods or services from Gallagher & Turner and this should carry acknowledgement of and information or notes about items left in our care regarding work to be done, extra responsibilities such as purchase of insurance (SEE BELOW) and payment methods (SEE BELOW), as well as contact details for both parties (where we say this we mean the Customer and Gallagher & Turner). It is the Customers responsibility to confirm that all required details are correct on the purchase order and to state clearly upon placing an order if the Customer does not accept our terms and conditions. We reserve the right to make changes to the price agreed on the purchase order should additional goods or services be ordered at a later date which relate to the items listed on that purchase order . This situation may arise due to problems with suppliers (SEE BELOW), or agreed changes made between the Customer and ourselves which relate to the service offered. 3. Completion Dates: Where possible we endeavour to keep to the time agreed for completion of an order, however, we cannot take responsibility for factors which we cannot predict or which are outside our control. This would include problems with suppliers upon whom we depend to supply stock, with illness, or with premises maintenance or access problems, but is not solely restricted to those problems. 3. Collection and Delivery: Unless specifically agreed beforehand, we do not generally deliver Customer orders. The price agreed will normally be for collection from either our gallery at 30 St Mary's Place, or our workshop at Unit 18, Hoults Yard. We can arrange delivery, however, and will happily quote a separate price for this. 4. Installation: Gallagher & Turner are happy to provide an installation service for artworks at additional cost to any framing service offered. A quotation for installation, unless otherwise specifically stated, will be based upon the time taken and number of people required to carry out the work solely relating to the items on the quotation itself and no other item discussed later whilst on site, in addition to any specially required hardware such as security fixing sets. We would expect any movement of furniture or equipment, wall finishing such as painting or filling, cleaning of the area, heavy lifting equipment, scaffolding requirement and the provision of an accessible supply of power to be the responsibility of the Customer. 5. Payment: It is usually our policy to ask for a deposit of30% of the order value on reciept of the order (and this request is at our discretion), for which we will provide a reciept. Payment of the full balance can be made by the Customer with cash or a cheque supported with a bank card on collection or delivery. Credit terms of strictly 30 days may be given by prior arrangement with Gallagher & Turner. Title in any goods supplied by Gallagher & Turner will not pass to the Customer until they have been paid for in full, and Gallagher & Turner withhold the right to reclaim or repossess any goods supplied by themselves, or to enforce our legal rights to recovery of any unpaid sums and ensuing legal expenses in the event of a failure to comply with our terms of payment; during which entire process title to the goods will remain with Gallagher & Turner. 6. Insurance: Whilst we are aware of the need for care and attention to safeguarding the Customer's property, Gallagher & Turner will only accept items on the mutual agreement and understanding that the Customer will take full responsibility for the insurance against fire or theft or accidental damage of any item or artwork left in our care. We can provide a quotation for fire and theft (outside working hours) insurance if required, however a recent valuation acceptable to our Insurance Broker must be available in order for us to do this. 7. Materials: The materials used by Gallagher & Turner are supplied to the Customer in good faith of their merchantable quality and fitness for the purpose. Natural products such as wood may vary in colour, and are liable to movement and the innate qualities of natural products must be considered by the Customer upon agreement to purchase them. Gallagher & Turner will endevour to provide a high quality product which we expect to last, however there must always be a balance between the appropriate construction or use of materials and the environment in which they are eventually stored. Whilst we cannot take responsibility for the conditions in which the Customer will eventually house the item we may have encased or worked upon, we will act fairly in guaranteeing our work against timber or adhesive movement or changes up to a year from collection or delivery. We will not accept responsibility for any faults or deterioration of factory finished products (products finished by a supplier) beyond six months, but we are always open to negotiation on this. 8. Special offers and discounts: Occasionally Gallagher & Turner will run special offers and discounts on bespoke framing orders. Excluded from these promotions are any materials which need to be specially sourced from suppliers we do not currently use, materials or components which are made-to-order specifically for us. These exclusions include, but are not limited to non-standard mount boards, hand-finished mouldings or gilding work. Essentially we reserve the right to treat any case of complaint on a individual basis, whilst being under no obligation and being fully aware of the Customers rights under the legislation governing the supply and sale of goods and services. In the event of any dispute over the above terms, or Force Majeure, Gallagher & Turner ultimately withhold the right to suspend or cancel any agreements to carry out supplies of goods or services, and refund any sums paid out, or alternatively to recover costs where items have been purchased on a Customer's behalf.